FREE WINCH & BRUSHGUARD! Features 24" tires with steel rims, fuel injected & Kohler v-twin air cooled! POWERFUL, RELIABLE AND AS TOUGH-AS-NAILS. Depending on the model, the new Frontier Series of vehicles come powered by a 23 hp or 26 hp electronic fuel-injected air cooled Kohler Command Pro engine coupled with an efficient standard or high torque steering transmission for great performance in challenging terrain. Outfitted with a number of hunting specific accessories, customers can further customize their ride with multiple color, transmission, accessory and seating packages. Engine Type: 4 cycle OHV gasoline-powered engine features electronic fuel injection (EFI), full pressure lubrication and V-twin cylinders. Steering: One-piece, ergonomic handlebar. Steering control features hand brake. For safety and ease of handling, the Argo steering transmission provides continuous torque to all axels. Controls: Right-hand twist grip throttle. Dash mounted light and ignition switch. Clutch: Belt-driven, Continuously Variable Transmission (CVT) maximizes engine power to the transmission. Drive System: Chain drive to machined sprockets. 1 1/4 in. diameter axles with triple sealed greaseable outer bearings. Final Drive: RC50-2 and RC60 roller chain drive to all 8 axles. Frame: Formed steel channel frame, welded for high strength and durability. Protected with Bonderite® epoxy-acrylic base coat, textured black epoxy top coat. Body: R Belt-driven, Con AD STD Chain drive to ma Optional Formed steel channel frame, welded for h CLASSIC2 STD CLASSIC2 STD or HT ADMIRAL3 STD, HT or HS Optional Formed steel channel frame, welded for high strength and durability. Protected with Bonderite® epoxy-acrylic base coat, textured black epoxy top coat. Sta Standard Vacuum formed High Molecular Weight Polyethylene (HMWPE) on-piece lower body. Fuel Capacity: 7.1 US gallons (27 litres) See-through polyethylene fuel tank. 8 hrs. operation. Instrumentation: LCD digital gauge cluster: speedometer, odometer, voltmeter, hour meter, tachometer, low oil pressure, parking brake reminder lights and check engine light. 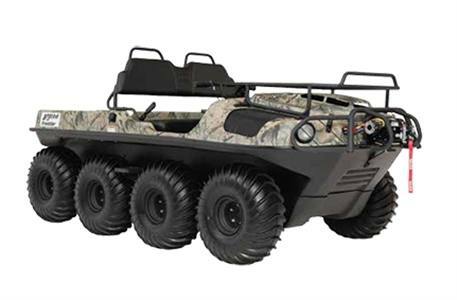 High Density Polyethylene (HDPE) All-Terrain Body: Both Argo's lower and upper body are manufactured using a high density polyethylene material that's engineered to keep water hazards out and environmental hazards in. The smooth, durable underbody floats over potential snags, stumps whether you're forging through the mud, skimming over snow or scrambling over hard rock. Transmission Options: Argo's parent company, Ontario Drive & Gear Limited, is a world leader in precision gearing and high performance transmissions. At the heart of every ARGO is a fully mechanical drivetrain based on ODG technology to ensure the best reliability, maintainability and smooth, efficient transfer of power to the ground. Frontier models feature the ‘Classic' or ‘Admiral', including Standard (STD) on the Limited models to suit your individual off-road riding style. Chain drive to machined sprockets. 1 1/4 in. diameter axles with triple sealed greaseable outer bearings.